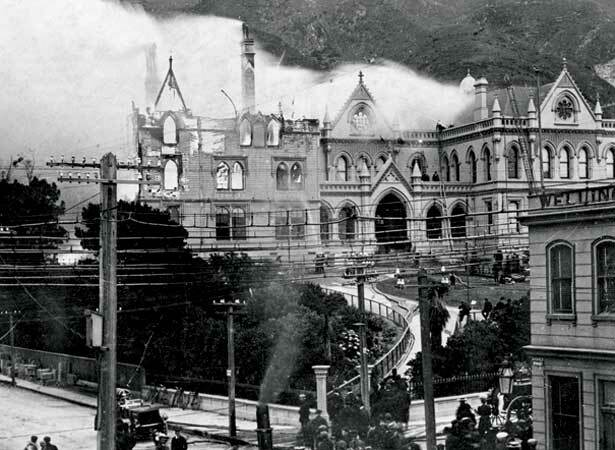 The country narrowly avoided a great library bonfire in 1907, when fire swept through Parliament Buildings in Wellington. At 2 a.m., Parliament’s nightwatchman thought he heard rain on the roof, but when he went to check found that a substantial blaze had broken out. He sounded the alarm, threw open the gate for the fire brigade and tackled the fire with a hose. The fire, probably started by faulty electric wiring in the ceiling of the interpreters’ room, spread rapidly through the old wooden parts of the buildings and then into the masonry additions of the 1880s. By 5 a.m. it had destroyed Bellamy’s restaurant and fire crews were battling desperately to save the library. Staff and volunteers moved more than 15,000 volumes from the building’s ground floor as a precaution against the flames breaking through. The morning light revealed the scale of the devastation: the old wooden buildings were completely destroyed, but the brick walls and metal fire door had saved New Zealand’s de facto national library, and the 80,000 volumes and many other treasures inside. We have 2 articles, related to Parliamentary library escapes fire .